The SignaLink USB brings the A/D, D/A converters and op amp closer to the transceiver interface, which reduces overall noise in the system. Better yet, instead of manipulating the sound levels by using a computer mouse or track ball, traditional pots and knobs have been installed on the front of the unit. This makes it much easier to adjust the receive and transmit levels for the various digital modes. The SignaLink USB transmit/receive switching time can be controlled by an external time delay pot. The SignaLink even obtains its 5 V dc power from the USB connector, so that’s another issue solved. If you have several transceivers you could use a number of these units, each connected to its own USB port. FSK9601 (G3RUH-compatible modem) for 9600 Baud FSK. This modem can be easyly modified for other baudrates from 4800 up to 614k Baud. Born in the Summer 1997 as a 9600 bps G3RUH compatible modem, the YAM s a multi-standard modem capable of AFSK 1200 bps and Manchester-FSK 2400 bps operations. The YAM modem integrates all the functions of a packet radio modem and parts of those of implemented in a TNC using only three integrated circuits and interfaces directly to a PC serial port from which it is also powered. 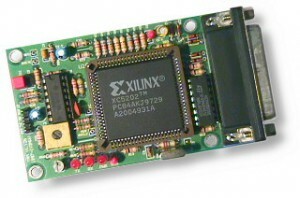 The YAM introduces a substantial new in the arena of packet radio modems and is based on a FPGA (Xilinx’s Xc5202) which includes a large amount of logice resources allowing a reduced components count and a more compact form factor. The programming of a FPGA, often called “FPGA configuration”, is not a permanent operation, like in a PROM memory, but temporary like in a RAM memory. This feature is used to reconfigure the YAM modem and to fastly toggle its operating mode among FSK, FSK/Manchester e AFSK accordingly to the user needs. The YAM gate array is programmed via the serial port which connects the modem to the PC by means of a software utility which, in few seconds, programs the modem and uploads the required configuration data. When Packet Radio was getting underway in the late 1970s and early 1980s most people did not have very much computing power. Many hams (including me) wanted to operate packet with a Commodore 64, Vic 20, or CP/M computer that had a maximum of 64KB (yes, that KB, not MB or GB) of memory. There just wasn’t much horsepower in those machines, but one thing that everyone had available was a terminal program. It was the lowest common denominator. So when designers developed TNC’s in that era they designed them to work with anything that had a terminal emulator on it. As a result, they built nearly all of the intellegence in the TNC itself. Those TNC’s had at least two modes. There was a “command mode” that allowed someone using a terminal program to set any of the dozens of parameters that were needed to optimize communications and it had a “converse mode” that packaged data and passed it to the radio to be transmitted. UZ7HO is a software dual-port Packet-Radio TNC that uses a soundcard as a modem and supports AX.25 protocol. The software Packet-Radio TNC uses the AGW Packet Engine API and emulates the AGW Packet Engine (TCP/IP interface) and a kiss TCP/IP server. It has been tested on Windows XP, Vista, 7, 8 and has proved stable in operation. At the moment there are two version, one for low speed and one for high speed packet. MixW for digital modes may be used without TNC. The only requirements are a computer running Windows 9x, ME, NT4, 2000, XP, Vista and Windows 7 operating system with compatible soundcard. One of the RigExpert USB interfaces is recommended. As time passed computers came along that were much more powerful. Many packet programs were developed that offered a lot more functionality and a more customized user interface. However, it was desirable to create a single interface that could be run on all TNC’s that would look the same to the software program. At the same time, since computers had more processing power, it was possible to move some the data packaging functions from the TNC to the computer as well. There were a couple of different protocols developed for doing this, but the one that achieved the widest acceptance was “KISS” mode (for Keep it Simple Stupid). It was developed by Mike Chepponis and Phil Karn in 1987. Almost all recent vintage TNC’s have a KISS mode and a lot of software takes advantage of this. For these programs, the first thing the software does when it runs is to put the TNC into KISS mode. A KISS mode TNC is simply one that is always in KISS mode. There are a number of advantages to this. First, the TNC is substantially less complicated than one that supports the older modes. There are almost no parameters to set; you just turn it on and let it run. Because it is so much simpler it also generally has fewer parts and is less expensive and easier to build. For example, the price of a Kantronics KPC-3+ is $200. The price of a TNC-X (including enclosure) is $66 without USB or $86 with USB. Why pay for all of the functionality of a KPC-3, if you are only going to use it in KISS mode? In addition, some conventional TNC’s have been known to “fall out” of KISS mode rendering them useless until they are rebooted. The downside to a KISS mode TNC is that it cannot be used with a simple terminal program like a conventional TNC can. You must use software that supports KISS mode. Most packet programs these days do support KISS. Examples are WinTNC (for general purpose keyboard to keyboard communication), UIView, WinAPRS, MacAPRS and Xastir (for APRS operation), PacLink (for Win2K email), and the AGWPE packet engine. If you need mailbox functionality, or you need the functionality of the older “command” and “converse” modes, a KISS mode TNC will not be adequate for your needs. However, if you are planning to use the TNC to run modern software that supports KISS mode, there is no reason to pay for the additional functionality that you will never use.